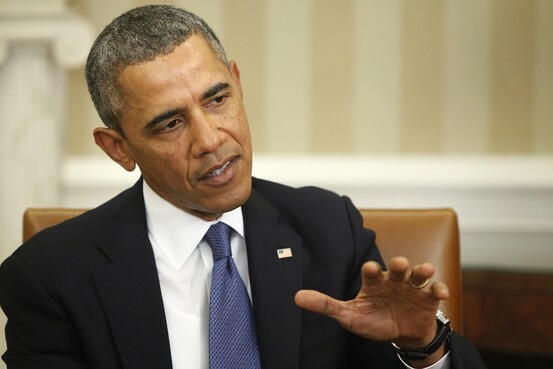 U.S. President Obama Monday accused Russia of violating Ukraine's sovereignity and international law. And the United States says it will take action to isolate Russia if Moscow does not pull its troops back to Russian bases in the Crimean region of Ukraine. VOA White House correspondent Luis Ramirez has more. WASHINGTON — U.S. lawmakers expressed support on Monday for aid for Ukraine's new government, as well as sanctions to punish Russia for its military incursion into the neighboring country, but want European nations to step up their involvement in the crisis. Senators are looking at options such as imposing sanctions on Russia's banks and freezing assets of Russian public institutions and private investors, Senator Chris Murphy, chairman of the Senate's Europe subcommittee, said. But he said in a telephone interview that European governments also needed to act. “Unilateral U.S. sanctions against Russia are not going to have much of an effect if Europe remains a haven for Russian banks and Russian oligarchs to stash and invest their money,” the Connecticut Democrat said. Democrats and Republicans on the Senate Foreign Relations Committee are preparing legislation - supported by members of both parties - to provide at least $1 billion in loan guarantees to provide structural support to Ukraine's economy. The measure would also authorize technical assistance for energy reforms, support elections, strengthen civil society, combat corruption and help Ukraine recover stolen assets, Democratic Senator Robert Menendez, the committee's chairman, said in a statement. The committee is also consulting with the Obama administration on possible actions against individual Russians - and Ukrainians who cooperated with them - ranging from visa bans and asset freezes to suspending military cooperation and sales, as well as economic sanctions. Republican U.S. Representative Ed Royce, chairman of the House of Representatives Foreign Affairs Committee, also said Washington needed to act with the Europeans to pressure Moscow via its state-run banks or through trade. “The Achilles heel for Russia is their economy, the ruble,” Royce said on CNN. European Union ministers held talks on the Ukraine crisis on Monday, but agreed on no deadlines or details about any punitive measures that could be put in place against Russia. Republican Senator John McCain, one of his party's leading foreign policy voices, said he felt German Chancellor Angela Merkel in particular had been too timid. Merkel and her three-month-old coalition government have gone out of their way to avoid antagonizing Russian President Vladimir Putin, remaining measured even as Washington and other capitals ratcheted up the rhetoric. Germany is heavily dependent on Russian natural gas and is closer to Moscow than any other leading Western nation. In the face of the diplomatic maneuvering over how to confront a bellicose Russia in Ukraine, one country appears to hold the key to any long-lasting entente: Germany, Europe’s economic powerhouse and one of Russia’s primary trading partners. Whether it is importing fuel from Gazprom or selling Mercedes-Benz to billionaire oligarchs, trade with Russia has played an important role in Germany’s emergence as an economic superpower over the last decade. Germany is now heavily reliant on Russia for its energy needs, importing more natural gas from Russia than any other country in Europe. But Germany’s enhanced status on the world stage — combined with the end of the commodity boom and the onset of economic stagnation in Russia — has also shifted the balance of power. Some analysts argue that it is Russia that has the most to lose if economic sanctions are ever imposed. This dynamic could offer insight into the role that the German chancellor, Angela Merkel, will play in any negotiations with the Russian president, Vladimir V. Putin. So far, German diplomats have tacked away from a plan, pushed by the United States, to impose sweeping sanctions and remove Russia from the Group of 8 developed economic nations. Instead, the German chancellor has called for a more diplomatic solution, preferring more limited actions like many of her European counterparts. But Ms. Merkel, a champion of closer ties between Ukraine and the European Union, has also shown a willingness to take a hard line with Mr. Putin. In recent months, Ms. Merkel has been particularly forceful on human rights issues. For example, she played a crucial part in the release of the jailed oilexecutive, Mikhail Khodorkovsky. Ten years ago, Mr. Aslund points out, it was Russia that was in ascendance, as high energy prices, robust economic growth and political stability made the country a darling for foreign investors. By comparison, the German economy was seen as dull and less than competitive. Germany is one of the Russian Federation’s main trading partners. Russia’s primary exports to Germany are raw materials — natural gas and oil in particular — while Germany’s exports to Russia are mainly mechanical engineering products, vehicles and parts, and chemicals. Now, Germany has a current-account surplus that amounts to 6 percent of gross domestic product — an important indicator of economic strength and competitiveness. And Russia is being lumped together with other struggling emerging countries and has witnessed a fast erosion of its once-sizable surplus. There are two sides to Germany’s economic relationship with Russia: a reduced reliance on the country as an export market, countered by energy imports that remain strong. While companies like Mercedes and Volkswagen are significant exporters to Russia, over all it ranks 11th, behind Poland, as a market for German goods. In fact, many of Germany’s top exporters have for years been focusing on China and other more dynamic markets in Asia. Jörg Howe, a spokesman for Daimler, the parent company of Mercedes, said that at the moment the company did not expect the crisis to affect sales of its cars. He described Russia as an important market, though not on the same scale as China, Germany or the United States. Russia has become a more difficult country for business during a time of increased financial and corporate scrutiny, making German companies less excited about investing in the country. Russia ranks near the bottom in global surveys that assess levels of corruption and how easy it is to do business, said Mr. Aslund. The worsening political situation with Ukraine has already hurt trade with Germany, which fell to 76.5 billion euros ($105 billion) in 2013 from 80.5 billion euros ($111 billion) in 2012. Still, some 6,000 German companies are active in Russia, and it is an important market for midsize companies like Martin Kannegiesser, a firm in Vlotho, Germany, that supplied industrial laundry equipment for the Sochi Olympics. And there is clearly concern that the conflict in Ukraine could further hurt trade, as the market jitters on Monday underscored. German stocks were off more than 3 percent for the day. From an economic perspective, Ukraine is much less important to Germany than vice versa. German foreign direct investment in Ukraine stands at about $6.3 billion, a relatively modest sum that still accounts for more than 10 percent of the total in Ukraine, according to the German Foreign Ministry. Germany is the second-largest foreign investor in Ukraine behind Cyprus, which is a transit point for Russian money. Still, Germany does not have the upper hand entirely in its relationship with Russia. About three-quarters of the gas and oil that Germany imported in 2013 came from Russia. The country also acts as a major gas transit hub for countries like France. If there was a long-term shutdown of Russian gas, Germany would not be the only country to suffer. Prices would increase and supplies would be squeezed for countries like Turkey and Italy that also rely on Russian energy imports. “Germany in particular is dependent on Russian gas,” said Trevor Sikorski, an analyst at the London research firm Energy Aspects. Still, analysts point out that as energy sources multiply and gas storage levels remain high in Europe, the prospect of a long-lasting energy crisis as a result of the recent turmoil seems fairly remote. This shift in status notwithstanding, Germany has taken pains to play an engaged and nuanced diplomatic role that reflects not just its economic heft in the region, but its ability to bridge the widening chasm between Russia and the United States. It is a sensitive balance for the country, which, unlike France, has tended not to take aggressive diplomatic stands on pressing global issues. But Germany’s economic power is on the rise, lifted by export success in Asia and a calming of the debt crisis in the euro zone. So economists like Mr. Aslund say the next trick — and it is a challenging one — will be for Germany to leverage that influence into a lasting diplomatic agreement between Russia and Ukraine. (Reuters) - One senior Obama administration official called Vladimir Putin's actions in the Ukraine"outrageous." A second described them as an "outlaw act." A third said his brazen use of military force harked back to a past century. "What we see here are distinctly 19th and 20th century decisions made by President Putin," said the official who spoke on condition of anonymity to a group of reporters. "But what he needs to understand is that in terms of his economy, he lives in the 21st century world, an interdependent world." James Jeffrey, a retired career U.S. diplomat, said that view of Putin's mindset cripples the United States' response to the Russian leader. The issue is not that Putin fails to grasp the promise of western-style democratic capitalism. It is that he and other American rivals flatly reject it. "All of us that have been in the last four administrations have drunk the Kool-Aid," Jeffrey said, referring to the belief that they could talk Putin into seeing the western system as beneficial. "'If they would just understand that it can be a win-win, if we can only convince them' - Putin doesn't see it," Jeffrey said. "The Chinese don't see it. And I think the Iranians don't see it." "There have not been attacks on ethnic Russians," said Kathryn Stoner, a Stanford University professor and leading expert on Russia. "That's just a lie. There was no threat to the (Russian naval) base in Crimea. That is just absurd." In Putin's eyes, the United States may struggle to claim any moral high ground. Some Russian and European commentators point out that the United States intervened in Kosovo in 1999 and invadedIraq in 2003 without United Nations approval. And Russian officials have repeatedly said they regret not vetoing the U.N.-backed 2011 NATO intervention in Libya. Whatever Russia's intervention represents, the immediate economic leverage the United States has over Russia is limited, according to experts. The most potent weapon Washington could use would be sanctioning Russian banks, companies or individuals, similar to the sanctions that have proven so damaging to Iran's economy. "We're not going to get into any more detail about what's being considered," said one senior official who asked not to be named. "You are absolutely right about the vulnerability of Russian banks. We're looking at all of the options." Fiona Hill, a former National Intelligence Officer for Russia and Eurasia at the National Intelligence Council, credited Putin with strengthening Russia economically since gaining power in 2000. Though Russia still has economic challenges, Europe's dependence on Russian gas supplies gives Russia a trump card that did not exist during the post-Soviet chaos of the 1990s, she said. "In the years since Putin has come to power," she said, "he has removed our leverage." Putin has also increased the capabilities of the Russian military; crushed or co-opted dissent; and gained iron control of Russia's media. Throughout the crisis in Ukraine, Russian media have portrayed the protests that overthrew the country's pro-Russian president as an American-backed coup. Hill said recent public opinion polls show that 60 percent of Russians approve of Putin's actions in the Ukraine. "The biggest blow would be the largest companies in Germany not doing business" with Russia, Hill said. "That is what Putin banks on: Russia is too big and important." Stoner, the Stanford professor, said that Putin had outmaneuvered the United States and Europe. Officials in Washington and Brussels had failed to anticipate - or counter - Putin's methodical re-assertion of Russian power. "NATO and the US, in particular, but also Germany - we've all been caught off-guard here in terms of anticipating this sort of behavior," she said. "It's beyond what people would have expected." Jeffrey, the former American diplomat, called for a renewed long-term Western effort to increase leverage over Putin. He argued that the economies of the United States and Europe - which are roughly $30 trillion combined - dwarf Russia's $2.5 trillion economy. He said long-term steps would be accelerating the negotiation of a trans-Atlantic free trade partnership and measures that would increase American natural gas supplies to Europe. A short-term step would be offering major economic aid to Ukraine's desperately cash-strapped new government. "We are tremendously more powerful than him," Jeffrey said. "We ought to be able to bail out Ukraine. We ought to be able to make Europe less energy dependent on Russia." "The Chinese," Jeffrey said, "are in the same position." Operation Barbarossa (German: Fall Barbarossa, literally "Case Barbarossa") was the code name for Germany's invasion of the Soviet Union during the Second World War. Beginning on 22 June 1941, over four million soldiers of the Axis powers invaded the USSR along a 2,900 km (1,800 mi) front, the largest invasion in the history of warfare. In addition to troops, Barbarossa used 600,000 motor vehicles and 750,000 horses. The ambitious operation was driven by Adolf Hitler's persistent desire to conquer the Soviet territories as embodied in Generalplan Ost. It marked the beginning of the pivotal phase in deciding the victors of the war. The German invasion of the Soviet Union caused a high rate of fatalities: 95% of all German Army casualties that occurred from 1941 to 1944, and 65% of all Allied military casualties from the entire war.Operation Barbarossa was named after Frederick Barbarossa, the medieval Holy Roman Emperor. The invasion was authorized by Hitler on 18 December 1940 (Directive No. 21) for a start date of 15 May 1941, but this would not be met, and instead the invasion began on 22 June 1941. Tactically, the Germans won resounding victories and occupied some of the most important economic areas of the Soviet Union, mainly in Ukraine. Despite these successes, the Germans were pushed back from Moscow and could never again mount a simultaneous offensive along the entire strategic Soviet–German front. The Red Army repelled the Wehrmacht's strongest blow, and Adolf Hitler did not achieve the expected victory, but the Soviet Union's situation remained dire.Operation Barbarossa's failure led to Hitler's demands for further operations inside the USSR, all of which eventually failed, such as continuing the Siege of Leningrad,Operation Nordlicht, and Operation Blue, among other battles on occupied Soviet territory.Operation Barbarossa was the largest military operation in history in both manpower and casualties. Its failure was a turning point in the Third Reich's fortunes. Most importantly, Operation Barbarossa opened up the Eastern Front, to which more forces were committed than in any other theater of war in world history. Regions covered by the operation became the site of some of the largest battles, deadliest atrocities, highest casualties, and most horrific conditions for Soviets and Germans alike—all of which influenced the course of both World War II and 20th-century history. The German forces captured over three million Soviet POWs in 1941, who did not enjoy the protection stipulated in the Geneva Conventions. Most of them never returned alive. Germany deliberately starved the prisoners to death as part of its "Hunger Plan", i.e., the program to reduce the Eastern European population. LIMA, Peru — The battle for Venezuela is being fought as vigorously online as on the streets, with opposition activists tracking the government crackdown on social networks, and authorities fighting back by cutting Internet to a clash-torn city, and selectively blocking websites and a communication app popular with protesters. Beatriz Font, a local TV reporter in San Cristobal, capital of the western border state of Tachira, said Thursday night that she could hear gunshots and police were breaking up protests just as they had the night before when Internet service was cut in this city. “We’re still without Internet. And some people don’t have water or electricity either,” Font said from this university town which has seen some of the fiercest anti-government demonstrations. Later, the U.S. company Zello said Venezuela’s state-run telecoms company, CANTV, had just blocked access to the push-to-talk, “walkie-talkie” application, a hugely popular organizing tool for protesters from Egypt to Ukraine. The app for smartphones and computers supports up to 600 users on a single channel, and company CEO Bill Moore said it became the No. 1 app in Ukraine on Thursday for both the Apple and Android operating systems. In one day this week, Zello reported more than 150,000 downloads in Venezuela. Some believe Venezuela’s information war, which last week included the government’s blocking of images on Twitter after violence in Caracas claimed three lives, is only just beginning. The socialist government cemented a near-monopoly on the country’s broadcast media during the 14-year rule of President Hugo Chavez, who died last March, and social media have been crucial in recent days for opposition activists as they organized and exchanged information on deaths, injuries and arrests. Net-savvy activists reported a serious nationwide degradation in Internet service provided by CANTV, which handles about 90 percent of the country’s traffic. They said websites including <a href="http://NTN24.com" rel="nofollow">NTN24.com</a>, a Colombia-based regional news network, and <a href="http://pastebin.com" rel="nofollow">pastebin.com</a>, bulletin boards that cyberactivists use to anonymously share information, were being blocked. U.S.-based company Renesys, a top analyzer of global Internet traffic, confirmed the website blocking and service degradation, but said it could not determine if CANTV was decreasing bandwidth. “I certainly don’t know from our data if it is deliberate, although given the context, it seems plausible,” said Renesys researcher Doug Madory. Venezuela’s traffic to its close ally Cuba over the ALBA-1 cable, meanwhile, appeared unaffected, he said. Programmer and cyberactivist Jose Luis Rivas, who is from San Cristobal but did give his location for fear of persecution, said the Internet went out in most of the city of 600,000 about midnight Wednesday. All across Venezuela since street protests accelerated last week, opposition activists have posted online YouTube videos of riot police and national guard breaking them up. Sometimes the security forces are accompanied by pistol-packing motorcycle gangs of Chavista loyalists that the opposition also blames for killings and other abuses. Rivas said that on Wednesday night, before the Internet went out in San Cristobal, people were live-streaming video of a crackdown by security forces. Government officials have not commented on the Internet outage and did not respond to Associated Press queries on either it or the service degradation and website blocking. Spokespeople for Conatel, the government telecommunications regulator, and the Ministry of Information, said they were not authorized to discuss the matter. Hacktivists have indeed been attacking government websites from abroad, rendering many unreachable with denial-of-service attacks that flood them with data packets. Twitter also continued to tweet a workaround that lets users in Venezuela to receive tweets on their cellphones via text message. Venezuela has been blocking websites that track the black market rate for the country’s currency for months and that blocked access for some weeks to the popular Web address-shortening application Bitly. The international director of the Electronic Frontier Foundation, Danny O’Brien, said he thought the Venezuelan Internet censorship to be “somewhat haphazard and arbitrary,” indicating that not a great deal of thought had gone into it. Nearly half of Venezuela’s population relies on government-controlled media as its sole information source, the rest on the Internet. But cutting off Internet is not smart political strategy, said O’Brien. “I think the important lesson people should learn from these Internet blackouts is that they just throw fuel on the flames of civil unrest,” he said. “We have a weak and indecisive president that invites aggression,” Sen. Lindsey Graham (R-S.C.) proclaimed Sunday on CNN. In theory, it is possible for Obama to rule domestic politics with an iron fist and yet play the 98-pound weakling in foreign affairs. But it doesn’t make a lot of sense that one person would vacillate between those two extremes. A better explanation is Obama’s critics are so convinced that he is wrong about everything that they haven’t paused to consider the consistency of their accusations. Obama is neither tyrant nor pushover. In general, the criticism of him being inconsistent and indecisive is closer to the mark. But the accusation that he has been feckless in Ukraine is still dubious, because those demanding a stronger response have been unable to come up with one. But if Obama had made specific threats toward Russia, he would have set himself up for the conservatives’ criticism of his Syria policy — that he was drawing “red lines” that he wasn’t prepared to enforce. And suppose he were willing to draw red lines and back them up with military might. Inevitably, he’d be accused of trying to distract from Obamacare or other domestic troubles, as he was when he threatened a military strike on the Syrian regime. Even critics of the “weak” Obama response don’t propose a military response in Ukraine. When Russia invaded Georgia in 2008, there was, similarly, no consideration of military action by President George W. Bush’s administration, and Vladi­mir Putin got away with his aggression. Putin also would be swayed, no doubt, by Rubio’s “decisive” call to boycott the June G-8 summit in Russia; Obama, by contrast, had merely cut off planning for the gathering. The difference between the two positions is one of fine calibration — not a contrast between strong and weak. Grabbing power with trembling inaction? Only the most diffident of despots could pull that off. KIEV, Ukraine — Secretary of State John F. Kerry brought a pledge of $1 billion in U.S. loan guarantees for Ukraine’s new anti-Russian leadership as he arrived in Kiev to show solidarity with former opposition leaders now facing a military standoff with Moscow. Kerry was in the Ukrainian capital for talks Tuesday that U.S. officials hope will help the interim leaders in Ukraine prepare for elections and recover looted assets. Russian President Vladimir Putin orders his troops to return to base Tuesday as his ultimatum for Ukrainian warships to surrender passes without action. The secretary of state is in Ukraine to show support for the new leadership amid a standoff with Moscow. She said she still remembers the terrified screams of a woman on the night the athlete killed his girlfriend. Internet giants promote competition and customer service, seen as inimical to one-party rule. Kerry is the highest-level American official to come to the former Soviet republic since the ouster of Ukraine’s Russian-backed leadership 10 days ago and Russia’s move to occupy Ukraine’s strategic Crimean Peninsula. Kerry is pledging economic and technical help for the new leadership, but no military backing now. New economic sanctions against Russia are coming in “days, not weeks,” a U.S. official traveling with Kerry said. The United States watched with alarm as the confrontation with Moscow over Ukraine escalated in recent days, including with an apparent Russian attempt to fly military aircraft into Ukrainian airspace Monday. Moscow has sent as many as 16,000 troops onto the streets to guard Russian military assets in Crimea. Kerry was not planning to travel to Crimea. In Kiev, Kerry was visiting a memorial to some of the scores of civilians killed when government forces opened fire last month on street protests against the Moscow-backed government of President Viktor Yanukovych. Yanukovych fled to Russia more than a week ago and maintains he is still Ukraine’s legitimate leader. Kerry has argued that Yanukovych lost his claim on power when he fled, and he said the new government deserves solid Western backing to begin work and to recover stolen national assets. Although Kerry’s trip was a firm symbolic boost to the new leadership, U.S. officials traveling with him said the United States and other Western states are trying to give Russia a graceful way to back down. Sending international monitors to Crimea to ensure that Russian speakers are not mistreated is one option, officials said. The $1 billion Kerry is offering is pending approval by Congress. It would help protect Ukraine from likely price increases for energy if Russian supplies are slashed. SIMFEROPOL, Ukraine — The prime minister of Crimea, the autonomous Ukrainian republic seized by Russian military forces, said on Tuesday that a majority of Ukrainian military units on the peninsula had surrendered and pledged allegiance to his pro-Russian government, and that local officials were working to speed up a referendum on independence. Speaking at a news conference on Tuesday morning, Prime Minister Sergei Aksyonov said that regional officials were in control of the security situation, even as armed standoffs continued between Russian forces and Ukrainian troops at several military installations, including a base near the airport of Belbek near Sevastopol. “There is no safety threat to human life in Crimea,” Mr. Aksyonov said. He said that a referendum on independence from Ukraine scheduled for March 30 would likely be held sooner, but he offered no details. He said that he had not been in contact with Viktor F. Yanukovych, the ousted president of Ukraine who fled to Russia but has said he plans to return. Mr. Aksyonov said that Crimean armed forces were now in a position to ensure the security of the peninsula on their own but that military officials were working with commanders of the Russian Black Sea Fleet, which is based in Sevastopol under a long-term lease. In recent days, soldiers wearing uniforms with no identifying insignia have taken up positions around military bases and other security installations across the peninsula, including outposts and headquarters of the federal border police and some government buildings. They are assisted by self-defense militia groups in plain clothes wearing armbands. On Tuesday morning, there were plainclothes security guards controlling access to the regional administration building, as well as a group gathered near the regional Parliament in the center of the city, including Cossacks in ethnic uniforms and some older men in green camouflage, along with volunteers cooking food. Unofficial vehicle checkpoints have also been established throughout the Crimean peninsula, often with the red, blue and white Russian flag flying over the barricades, though the purpose of the checkpoints has not been clear. The people operating them say they are providing security. At the base near the Belbek airport, several hundred Ukrainian and Russian forces were in a standoff that began overnight. A column of roughly 200 unarmed Ukrainian troops approached the Russian positions on the edge of the airfield singing. As they neared a Russian Humvee and three Russian soldiers blocking the road, Russian troops took up firing positions on one side of them, and as the column got nearer, a shot was fired in the air above them. 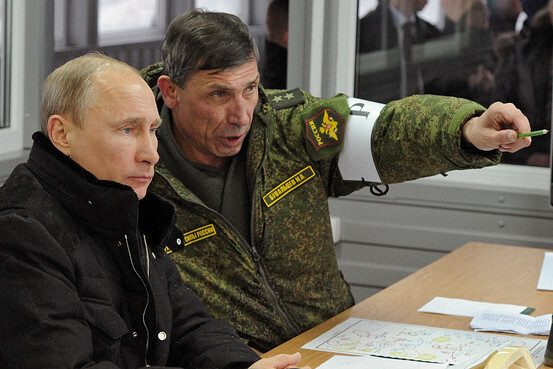 The Ukrainian commander called a halt three feet from the Russians and a negotiation ensued. After about 30 minutes, a dozen Ukrainian soldiers were permitted to march through the barrier to take up their usual guard duties. At a port in Sevastopol’s North Bay, two Ukrainian naval vessels, the Slavutych and the Ternipol, were being blockaded by Russian ships. Under the terms of Russia’s lease for the headquarters of the Black Sea Fleet, the location and movement of military personnel and equipment is restricted to designated areas. In recent days, however, troop carriers, Humvees and other military equipment with license plates designating them as part of the Black Sea Fleet have appeared throughout the peninsula. Since Russian soldiers began deploying late last week, beginning at the two main airports, local officials have sought to convey a sense of threat against Crimea from the provisional government in Kiev. They have denounced the toppling of Mr. Yanukovych as a coup and expressed fears of “fascist” right-wing groups that support the uprising in Kiev. The anti-Yanukovych protests were supported by a number of nationalist groups popular in western Ukraine, including the Svoboda Party, which controls about three dozen seats in the Parliament, and other, more militant right-wing groups known for anti-Russian rhetoric. Mr. Aksyonov appealed to President Vladimir V. Putin for help in assuring the security of Crimea and Mr. Putin promptly received authorization from the Russian Parliament to use military force. Crimea, which has enjoyed a large degree of autonomy since shortly after Ukraine gained its independence after the collapse of the Soviet Union, is heavily pro-Russia, and feels close cultural ties to Russia. The majority of people in the peninsula identify themselves as ethnically Russian, with ethnic Ukrainians and Crimean Tatars the largest minority groups. MOSCOW/KERCH, Ukraine (Reuters) - President Vladimir Putin said on Tuesday that Russia saw no need to use military force in the Crimea region of Ukraine for now, in remarks apparently intended to ease East-West tension over fears of war in the former Soviet republic. The use of force by Russia in Ukraine would be a choice of last resort, Putin said, and sanctions being considered against Moscow by the West would be counter-productive. Putin told a news conference at his state residence outside Moscow there had been an "unconstitutional coup" in Ukraine and ousted leader Viktor Yanukovich, an ally of Russia, was still the legitimate leader of the country despite giving up all power. Earlier on Tuesday, Putin ordered troops involved in a military exercise in western Russia, close to the border with Ukraine, back to their bases. Russian financial markets rebounded after sharp falls on Monday, and the euro and dollar rose in Japan, though Moscow's forces remained in control of Ukraine's Crimea region, seized bloodlessly after Yanukovich was ousted last month. Russia paid a heavy financial price on Monday for its military intervention in Ukraine, with stocks, bonds and the ruble plunging as Putin's forces tightened their grip in Crimea, whose population is mainly ethnic Russian. The Moscow stock market fell more than 10 percent on Monday, wiping nearly $60 billion off the value of Russian firms, but Russian stock indexes rose more than 4 percent early on Tuesday before slipping back again slightly, though still up on the day. 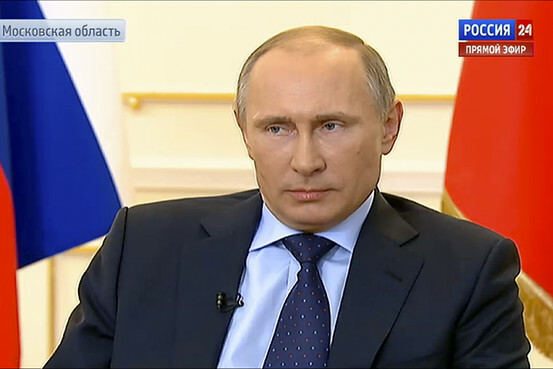 Putin said the turmoil in Russian markets was a "tactical, temporary" decision by investors. U.S. Secretary of State John Kerry will propose ways for a negotiation between Russia and Ukraine to be overseen by a multilateral organization when he visits Kiev on Tuesday. However, Gazprom chief Alexei Miller also said the company could offer Ukraine a loan of $2-3 billion to pay off the country's debt of more than $1.5 billion after Ukraine said it was unable to pay in full for gas deliveries in February, Interfax news agency said. But the military exercises in central and western Russia, which began last week and raised fears that Russia might send forces to Russian-speaking regions of east Ukraine, were completed on schedule. "The supreme commander of the armed forces of the Russian Federation, Vladimir Putin, gave the order for the troops and units, taking part in the military exercises, to return to their bases," Kremlin spokesman Dmitry Peskov was quoted as saying by Russian news agencies. Putin is dismayed that the new leadership in Ukraine, the cradle of Russian civilization, has plotted a course towards the European Union and away from what had been Moscow's sphere of influence during generations of Soviet Communist rule. Moscow's U.N. envoy told a stormy meeting of the Security Council that Yanukovich had sent a letter to Putin requesting he use Russia's military to restore law and order in Ukraine. Ukraine said observers from the Organization for Security and Cooperation in Europe, a pan-European security body, would travel at its invitation to Crimea in an attempt to defuse the military standoff there. President Barack Obama met national security advisers on Monday to discuss how the United States and its allies could "further isolate" Russia, a White House official said. "Over time this will be a costly proposition for Russia," Obama told reporters. The State Department said the United States was preparing to impose sanctions on Russia, although no decisions had yet been made. Members of the U.S. Congress are looking at options including sanctions on Russia's banks and freezing assets of Russian public institutions and private investors, but they said they wanted European states to step up their involvement. A Kremlin aide said that if the United States did impose sanctions, Moscow might drop the dollar as a reserve currency and refuse to repay loans to U.S. banks. An International Monetary Fund mission is in Kiev to discuss financial assistance for Ukraine to help it avoid bankruptcy. 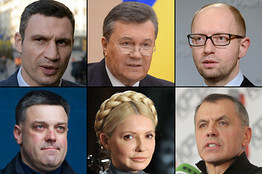 Kiev's new leaders want a financial package worth at least $15 billion, with a quick release of some of the cash. Ukrainian officials said Russia was building up armor on its side of the 4.5-km (2.7-mile) wide Kerch strait between the Crimean peninsula and southern Russia. Russian forces shipped three truckloads of troops by ferry into Crimea after taking control of the border post on the Ukrainian side, Ukraine's border guards spokesman said. Vladimir, a 50-year-old cab driver, said people do not want the Russians to leave. "When they are here, it is safer," he said, voicing the opinions of some in the region who fear a return to the chaos in Ukraine after the collapse of the Soviet Union. Kiev's U.N. ambassador, Yuriy Sergeyev, said Russia had deployed roughly 16,000 troops to Crimea since last week. Both sides have avoided bloodshed, but the market turmoil on Monday highlighted damage the crisis could wreak on Russia's vulnerable economy, making it harder to balance the budget and potentially undermining business and public support for Putin. EU leaders will hold an emergency summit on Thursday. Much of the conversation about the crisis in Ukraine is focused on whether President Barack Obamacan find a way to inflict some pain on Russian President Vladimir Putin in response to the Russian military moves there. But there is a similar question in reverse: Is Mr. Putin inflicting some political pain on Mr. Obama with his brazen actions? Answer: It’s too early to know for sure. The political consequences in the U.S. probably depend on whether the West manages to shield the new Ukrainian government from further Russian pressures. But it isn’t clear whether Americans think a different posture by Mr. Obama would have elicited a different Russian response to the popular uprising in Ukraine that unseated a pro-Russian president there. President Jimmy Carter faced a similar situation when Soviet troops invaded Afghanistan in late 1979; then, as now, critics charged that an appearance of American weakness had emboldened the Kremlin to act. About six weeks after that invasion, Americans were asked in a New York Times/CBS News poll whether the Soviets moved because they thought Mr. Carter was weak, or whether they would have moved no matter who was president. Just 25% said they moved because Mr. Carter was weak, while 66% said it wouldn’t have mattered who was president. In the case of Ukraine, public opinion is likely to be tempered by the fact that the Cold War has ended—though, as today’s Capital Journal column notes, Mr. Putin doesn’t always seem to think so—and by the fact that even Mr. Obama’s critics aren’t suggesting there is a logical military reaction to Russian moves in Ukraine. Moreover, there is a palpable sense of war weariness after a decade’s involvement in Iraq and Afghanistan. But the key, long-term factors in determining the way Americans judge Mr. Obama likely are whether he manages to rally a united Western response that really pinches Mr. Putin, and whether that response stops Russian troops from going further than they already have. The U.S. ambassador was waiting in the office of then-Ukrainian President Viktor Yanukovych in November, anxious for a decision that would cinch closer ties with the West, when he ran across a staffer bearing unwelcome news. "I can't believe it. I just came from seeing the president. He's told me we're going to put the European project on pause," Mr. Yanukovych's chief of staff, Serhiy Lyovochkyn, told U.S. Ambassador Geoffrey Pyatt, according to a person who was present. The ambassador asked how the president intended to explain the turnabout to 46 million Ukrainians expecting a new pact with the European Union. "I have no idea," Mr. Lyovochkyn said. "…I don't think they have a Plan B unless it's a dacha on the outskirts of Moscow." The exchange made clear the U.S. would have to come up with its own Plan B. For the previous two years, the Obama administration had sought to let Europe take the lead in guiding the westward political and economic drift of the former Soviet republic, with the U.S. in a supporting role. 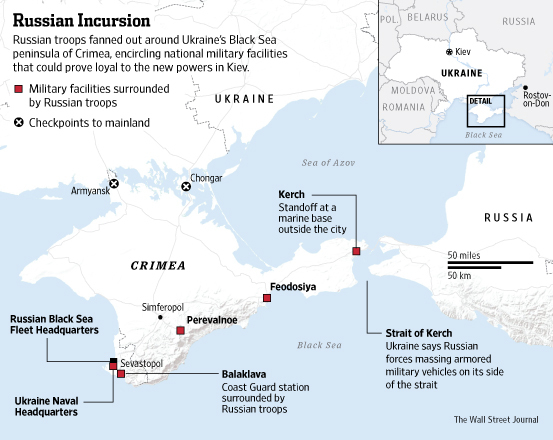 Ukrainian troops at bases in Crimea are surrounded by Russian forces. WSJ's Jason Bellini explains what that means, and gives #TheShortAnswer on what you need to know about Crimea. Now, the U.S. has been drawn front and center at a far more difficult time—after blood has been shed, battle lines drawn and Russian ire provoked. Locked today in the very East-West standoff the administration had hoped to avoid, "The U.S. is now in the lead," a senior U.S. official said. Many European diplomats felt that while the U.S. portrayed itself as acting tough in recent weeks, the Americans had left them alone on the Ukraine issue for far too long, preferring to prioritize Washington's own ties with Moscow. The White House decision to rely on Europe to cement ties with Ukraine was shaped by a foreign-policy doctrine meant to give international partners more responsibility for the world's challenges, U.S. officials said. By divvying up responsibilities, these officials said, the U.S. could focus on issues at home after more than a decade of costly wars abroad. There also was initial skepticism within the Obama administration that Mr. Yanukovych was serious about moving toward Europe. Few administration policy makers believed Ukraine should be an American responsibility because the issue was more important to Russia and Europe than to the U.S. Strategically, the Obama administration decided to take a back seat to Europe because of concerns that assuming the lead in Ukraine might backfire if Russia saw the European Union pact as a part of a superpower "Great Game" competition. Even with Russian troops streaming into Crimea, administration officials said Monday it wasn't clear if the outcome would have been any different had the U.S. taken a bigger role from the start. "The truth is Yanukovych left, and the new government is much more Western leaning. This is not a win for Russia," a senior administration official said. Talks between the EU and Ukraine date to the breakup of the Soviet Union, but in recent years they have focused on a sweeping trade and political pact known as the Association Agreement. 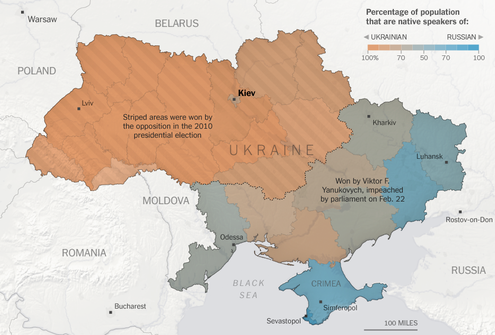 In 2012, Ukraine and the EU initialed an agreement that, once final, would draw them closer. The U.S. thought the Ukrainian leader might be bluffing about signing the Europe pact until mid-2013, when Mr. Yanukovych began taking more concrete steps. To bring Mr. Yanukovych closer to the West without provoking Russia, the U.S. and the EU settled on an informal division of labor, U.S. and European officials said. The EU's job was to get the pact signed by a November 2013 deadline. The U.S. would work with the International Monetary Fund to get Kiev to agree to tough economic reforms. The last thing the Obama administration wanted was another flashpoint with Russia. Relations between the two countries were already fraught over Russian President Vladimir Putin's support for the Assad regime in Syria and the decision to grant asylum to alleged National Security Agency leakerEdward Snowden. Russia began pressuring Ukraine to resist the pact by reducing Russian imports from Ukraine during the first three months of 2013. Russia followed with a targeted trade war to hurt Ukrainian oligarchs who favored European engagement. Unease was growing within the U.S. administration. The EU wasn't paying enough attention to Kiev's economic troubles and pressure from Russia, government analysts privately warned policy makers, U.S. officials said. Anxiety in Brussels surfaced in September, when Armenia, which had negotiated a similar trade and political deal with the EU, backed out and instead pledged to join the Russian customs union under pressure from Moscow. EU officials saw Armenia, which also faced economic and political pressure from Russia, as a warning sign and stepped up contacts with Ukraine. EU leaders expressed confidence the Ukraine deal would be signed, believing Mr. Yanukovych wouldn't reverse course after coming this far. At an October meeting of the Commonwealth of Independent States in Minsk, Mr. Yanukovych made his last strong defense of the European pact. He also had a brief meeting with Mr. Putin that day, and U.S. officials believe that was when a more forceful Russian campaign began. European divisions over Ukraine, with EU member states worried about antagonizing Russia, weakened the bloc's ability to influence Kiev's decisions, some diplomats said. Many member states believed the roadblock to a final agreement wasn't Russian pressure, but Kiev's refusal to meet European demands that it release—at least temporarily—imprisoned former Prime Minister Yulia Tymoshenko to receive medical treatment in Berlin. U.S. officials believe Russian officials persuaded Mr. Yanukovych to finally reverse course in a series of meetings in Sochi in early November. In one of those meetings, the Russians presented the Ukrainian delegation with a dossier spelling out potential damage to Ukraine's economy if the government moved ahead with the EU agreement, Mr. Yanukovych's advisers told U.S. officials. The dossier, U.S. officials said, set out specific financial losses and percentage declines in such sectors as aerospace and defense. While top European officials were meeting almost weekly with their Ukrainian counterparts, the U.S. had little in the way of high-level contacts. But on Nov. 18, a few days after Ambassador Pyatt's unexpected conversation with Mr. Lyovochkyn in the presidential office complex in Kiev, Vice President Joe Biden called Mr. Yanukovych, suggesting the U.S. could help counter Mr. Putin's offer. Russia has taken advantage of the new, weak government in Kiev by swiftly moving its troops into the Ukrainian province of Crimea. James Marson explains the events that led to this standoff. 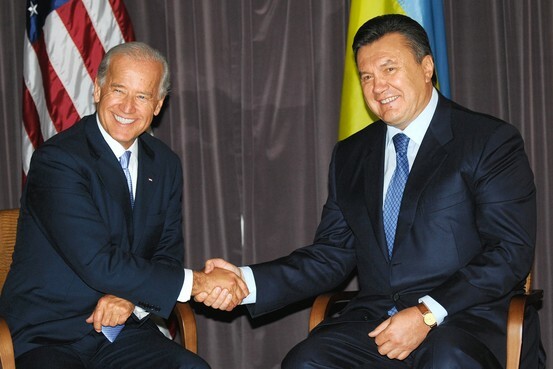 Mr. Biden, during a visit to Ukraine in 2009, had gotten along well with Mr. Yanukovych, a senior administration official said. He seemed receptive to Mr. Biden's blunt style, the official added. Mr. Biden's message was that the U.S. was prepared to work with both the IMF and the EU "to deliver the support Ukraine needed to get through the economic troubles," said a senior administration official briefed on the call, which Mr. Biden made while visiting Houston. The next day, Mr. Yanukovych met Stefan Füle, a former Czech foreign minister who was the bloc's point man on the deal, at the presidential palace. As the two officials sipped tea surrounded by top aides, Mr. Yanukovych presented new figures amounting to tens of billions of euros Ukraine would need to see through the reforms embedded in the EU deal. Frustrated by a fumbling translator and determined to convey a clear message to Mr. Yanukovych, Mr. Füle, who studied in Moscow in the early 1980s, switched into Russian during his response. The EU official rejected the numbers the president was citing and questioned whether Mr. Yanukovych was looking for excuses to justify his reversal. Mr. Yanukovych didn't respond to the appeals. On Nov. 21, the Ukrainian government announced it was putting the EU deal on hold, blaming the EU for failing to offer enough economic support. Even then, some European officials hoped Mr. Yanukovych would make a last-gasp change of heart when he arrived at a summit in the Lithuanian capital on Nov. 28, where he was supposed to have signed the deal. Those hopes were finally dashed that evening in a 75-minute meeting in a sparse meeting room on the ground floor of the Kempinski Hotel in Vilnius' central square. Mr. Yanukovych told the EU's two top officials he could advance the bilateral deal but offered no time frame for signing it, and demanded three-way talks with Russia and the EU in the meantime, according to a person familiar with the discussions. Those were deal-breakers for European Commission President José Manuel Barroso and European Council President Herman Van Rompuy, who refused to give Moscow direct say over the fate of a bilateral EU-Ukraine pact. The meeting ended in farce the next day. After the summit was formally over and faced with growing protests at home over his U-turn on the EU deal, Mr. Yanukovych rushed over to Mr. Van Rompuy and Mr. Barroso to urge them to agree to a Ukrainian drafted joint statement saying talks would continue. It is too late, the EU leaders told him. U.S. officials said they believed Mr. Yanukovych was looking for the easiest way to raise cash, regardless of the strings attached. EU officials said they weren't prepared to match the eventual $15 billion loan package from Moscow. U.S. officials tried to convince Mr. Yanukovych it was a bad deal. Moscow offered Ukraine cheap natural gas for three months. After that, prices would rise and Ukraine would be required to buy more, increasing the country's dependence on Russia. In his calls, Mr. Biden warned the besieged Ukrainian leader that he was "behind the curve" and putting himself in an "impossible position," said a senior administration official briefed on the calls. U.S. officials said Mr. Yanukovych was responsive at times, reversing some of the government's anti-protest laws after one of Mr. Biden's calls. "But it would always be grudging and halfhearted and too late," a senior administration official said. In Washington, Mr. Biden pushed to "wield the threat of sanctions" if Mr. Yanukovych decided to crack down on protesters, a message the vice president conveyed directly in a Dec. 6 call. But the Europeans were torn about sanctions, arguing against the risk of backing the Ukrainian leader into a corner. U.S. officials said the tipping point came on Jan. 16, when Mr. Yanukovych pushed through laws that effectively banned peaceful protests and outlawed opposition group activities. State Department officials and intelligence analysts warned the White House that Ukraine could be engulfed in civil war. In the last week of January, at a Situation Room meeting at the White House, Mr. Biden urged the administration to spell out in more detail what financial aid would be provided if Mr. Yanukovych and the opposition cut a deal, said U.S. officials briefed on the session. Mr. Biden was backed by Secretary of State John Kerry, officials said, and President Barack Obama agreed. A few days later, Mr. Kerry huddled with senior European officials on the sidelines of a security conference in Munich and delivered Mr. Obama's message: Get money ready, according to officials briefed on the discussions. In February, EU foreign ministers closed ranks with the U.S., saying they would respond quickly if the situation deteriorated, and, later, agreeing on sanctions. Mr. Kerry was in Paris in the third week of February for meetings when his French, German and Polish counterparts decided to fly to Kiev to try to broker a deal between Mr. Yanukovych and opposition leaders. The U.S. was skeptical, but Mr. Kerry and Mr. Biden agreed to help behind the scenes. In the end, U.S. officials said, they believed Mr. Yanukovych got cold feet about the power-sharing proposals, and then he disappeared. Many street protesters, meanwhile, resented the U.S. for saying it wanted to work with Mr. Yanukovych instead of booting him. The Obama administration is now preparing sanctions to respond to Russia's military intervention. "We're not putting Europe in the lead on this anymore," a senior U.S. official said. —Naftali Bendavid contributed to this article. MOSCOW—Russia's finance ministry said Tuesday it had halted the buying of foreign currencies for the reserve fund due to increased financial market volatility, which should ease downside pressure on the ruble. The finance ministry started buying 3.5 billion rubles ($95.9 million) of foreign currencies on the open market on Feb. 20 to stash the extra revenues from oil and gas exports in the rainy-day reserve fund. The finance ministry's decision to buy foreign currency worth 212.2 billion rubles by the end of May had a negative impact on the ruble in February despite the ministry's claim that its purchases won't have an impact on the exchange rate. On Monday, the ruble plummeted to its new lows against the dollar and the euro due to heavy selloff triggered by threats of sanctions from the West in response to Moscow's decision to send troops to Ukraine. The central bank had to change its intervention mechanism to stop the ruble from falling and sold more than $10.5 billion from its gold and forex reserves, the world's fourth largest. The central bank has also unexpectedly raised interest rates by 1.5 percentage points to ease downside pressure on the ruble. The finance ministry said it has bought foreign currencies worth 38 billion rubles for the reserve fund so far this year. Russian President Vladimir Putin said Tuesday that Russia reserves the right to use force in Ukraine to protect Russian-speaking residents there and called the toppling of former President Viktor Yanukovych's government an "unconstitutional coup." In his first detailed comments since Russian troops entered the restive Ukrainian region of Crimea, Mr. Putin insisted the presence of soldiers there was simply to defend the Russian military installation on the peninsula that is home to its Black Sea Fleet, but said he saw no need to send forces into eastern Ukraine yet. The further use of Russian force in Ukraine would be in line with international law, he said, because it was requested by Mr. Yanukovych, who he called the country's only lawful leader. Mr. Putin denounced the new government taking form in Kiev as "illegitimate," referring to them as "the people who call themselves the government." He said he understood the desire by Ukrainians for change but said "illegal change" could not be encouraged. "It was an unconstitutional coup and an armed seizure of power that took place. No one argues with that," Mr. Putin said. Still, he acknowledged that Mr. Yanukovych had no political future and said Russia would not rule out dealing with the winner of May presidential elections in Ukraine if what he called the "terror on the streets of Kiev" stopped. He brushed off Western threats of sanctions in response to Russian actions in Crimea as "mutually harmful." Mr. Putin's comments came as Russian state-run gas giant OAO Gazprom said it would cancel a contract for discounted gas deliveries to Ukraine starting in April, a decision that will put Ukraine's young government under further pressure. Earlier in the day, Russia's defense minister ordered soldiers involved in combat-preparedness drills across Russia to return to their bases, but the situation on the ground in Crimea remained tense. The military exercises had involved around 150,000 troops—some close to the border with Ukraine—as well as air defense and tank units and Russia's North and Baltic Sea fleets, leading to fears Russia was considering military action in mainland Ukraine. The order to return to their bases by March 7 didn't apply to Russian forces who have been sent into the majority ethnic Russian region of Crimea. Markets appeared soothed somewhat Tuesday, recovering some ground after falling sharply the day before over U.S. and European warnings of sanctions. Russian troops have effectively seized total control of the Crimean peninsula, and Ukrainian units that have remained there are surrounded. At the Belbek air base outside Sevastopol, home of Russia's Black Sea Fleet, Russian commanders who have taken over locked out several hundred Ukrainian staff who were trying to return to work on the airfield after spending the night in barracks on the compound. The Ukrainians and Russians were in negotiations. "We have been up to this point occupying our places jointly," said Col. Yuli Mamchur, the Ukrainian base commander, with armed Russians and Ukrainians side by side at each post. He described the scene as tense, but said there had been no fighting. "It's a process and we are talking," he said. Commanders at several Ukrainian military bases said they received an ultimatum from the Russian side to abandon their bases, but the deadline passed without incident in most places. Surprise military exercises--which were among the largest the country had undertaken in recent years--were ordered last Wednesday by Mr. Putin as the new Ukrainian government scrambled to consolidate power. They were scheduled to last until March 3. Russia had used such exercises in the past as a cover for plans to take military action, such as in the days before the war with Georgia in 2008. Two days after the drills were ordered, Russian soldiers began moving into Crimea. By the end of the weekend the region was effectively under Russian control. Russia's Defense Minister Sergei Shoigu had said the exercises had been planned months earlier and had nothing to do with the unrest in Ukraine. The drills involved ground, air defense and tank units from Russia's western and central military districts. The western district is based in St. Petersburg and stretches from Russia's western arctic to its border with Ukraine and Belarus. The central district is based in Yekaterinburg and stretches from Siberia to just west of the Ural Mountains. U.S. Secretary of State John Kerry was on his way to Kiev to meet with Ukraine's new leadership. The White House on Monday suspended military cooperation with Russia as well as talks aimed at boosting trade and investment, in a bid to isolate Moscow. WASHINGTON — The United States prepared Monday to impose sanctions on high-level Russian officials involved in the military occupation of Crimea, as the escalating crisis in Ukraine prompted turmoil in global markets, pounding the Russian ruble and driving up energy prices. The Obama administration suspended military ties to Russia, including exercises, port visits and planning meetings, just a day after calling off trade talks. If Moscow does not reverse course, officials said they would ban visas and freeze assets of select Russian officials in the chain of command as well as target state-run financial institutions. Congressional leaders signaled that they would follow with sanctions of their own, and quickly approve economic aid for the fragile, new pro-Western government in Ukraine. The besieged Kiev government said Monday that the Russians had deployed 16,000 troops in the region over the past week and had demanded that Ukrainian forces there surrender within hours or face armed assault. While Russia denied it had issued any ultimatums, it was clearly moving to strengthen its control over Crimea, the largely Russian-speaking peninsula in southern Ukraine where Moscow has long maintained a military base. In response to the Russian moves, European leaders indicated Monday that they would go along with limited action like suspending unrelated talks with Moscow and halting arms sales, but they resisted more sweeping efforts to curb commercial activity and investment in Russia. German officials emphasized the need for diplomacy, while Dutch diplomats ruled out sanctions for now. A British document photographed by a journalist said the government of Prime Minister David Cameron would not support trade sanctions or block Russian money from the British market. Without European backing, American officials worry that economic sanctions may not carry enough bite to persuade President Vladimir V. Putin of Russia to reverse course in Ukraine. 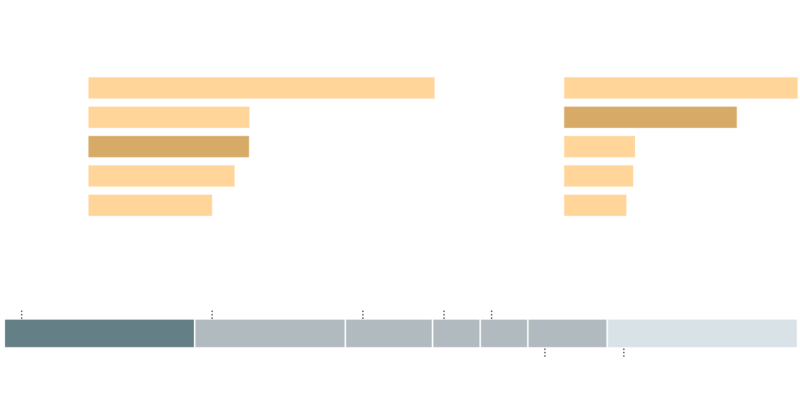 By itself, the United States is not even among Russia’s top 10 trading partners, with no more than $40 billion in exports and imports exchanged between the two each year. By contrast, Europe does about $460 billion in business with Russia, giving it far more potential clout, but also exposing it to far more potential risk. Even without taking action, Western officials hoped the immediate and unscripted reaction of world markets would give Moscow pause. Russia’s benchmark stock index dropped 9.4 percent, and the ruble fell to a record low against the dollar. The Russian central bank took the extraordinary step of raising interest rates by 1.5 percentage points, spending an estimated $20 billion to support the currency. In his first public comments on the confrontation in three days, President Obama said Monday that he was focused on assembling an economic aid package to shore up the Ukrainian government and asked that Congress make it “the first order of business,” drawing quick endorsements on Capitol Hill. Russia responded that it was only protecting its interests and those of Russians in Ukraine. “Those who try to interpret the situation as an act of aggression, threaten us with sanctions and boycotts, are the same partners who have been consistently and vigorously encouraging the political powers close to them to declare ultimatums and renounce dialogue,” Sergey V. Lavrov, the Russian foreign minister, said in a speech in Geneva. The crisis prompted tense meetings at the United Nations, NATO and the Organization for Security and Cooperation in Europe. NATO called its second emergency meeting on Ukraine in response to a request from Poland under Article 4 of the North Atlantic Treaty relating to threats to a member state’s security and independence. Meeting in Brussels, European Union foreign ministers called on Moscow to return its troops to their bases. They also threatened to freeze visa liberalization and economic cooperation talks and skip a Group of 8 summit meeting to be hosted by Russia in June. Heads of the European Union governments will meet in emergency session on Thursday to discuss the measures. Frans Timmermans, the foreign minister for the Netherlands, the largest Russian export market, told reporters that “sanctions are not in order today but sanctions will become inevitable” if there is no change in Russia’s position. Visiting Kiev, Britain’s foreign secretary, William Hague, urged Russia to pull back its forces or face “significant costs,” echoing comments made by Mr. Obama and Mr. Kerry, who was to arrive in Kiev, the Ukrainian capital, on Tuesday. But a British government document carried by an official near 10 Downing Street in London and photographed by a journalist indicated a resistance to tougher measures. The document, shown on the BBC, said that Britain should support ways of providing energy to Ukraine “if Russia cuts them off” but that European ministers should “discourage any discussion” of military preparations. “The U.K. should not support for now trade sanctions or close London’s financial center to Russians,” the document said. Russia is effectively the world’s biggest energy supplier, exporting more natural gas than any other country and more oil than any other nation after Saudi Arabia. Russia is also the biggest exporter of industrial metals and the fifth-biggest consumer market globally. “The biggest argument for severe economic sanctions not being imposed is that the European countries don’t have much of an alternative to Russian energy supplies,” said Jens Nordvig, the New York-based managing director of currency research at Nomura Holdings Inc.
Several of the biggest Western energy companies have major investments in Russia, including B.P. and Royal Dutch Shell. It may also be difficult for Mr. Obama to sell sanctions to the American business community if it is being cut off while competitors still have access to Russian markets. Russia is Pepsi’s second-largest market and a significant market, too, for companies like Boeing, General Motors, John Deere and Procter & Gamble. ExxonMobil, the largest American oil company, has a joint venture deal with the state-controlled oil company, Rosneft, to explore what may be a very rich Arctic area called the Kara Sea. ExxonMobil is also working with Rosneft on drilling in the Baltic Sea and on other projects. But congressional leaders said they would move forward with sanctions as well as aid to Ukraine. A Senate Foreign Relations Committee bill would use $200 million in aid and loan guarantees to leverage $1 billion in international economic assistance. An additional $50 million would be steered from existing State Department accounts for electoral administration. He was speaking as Secretary of State John Kerry headed for embattled Kiev to meet with Ukraine’s fledgling leadership, which forced Mr. Yanukovych out of office. In televised remarks reported by Reuters, Mr. Putin also said there was no need to use force at the moment in Crimea, Ukraine’s southern region on the Black Sea where Russian troops and naval vessels have encircled Ukrainian military facilities, saying they were protecting ethnic Russians. Mr. Putin’s remarks came after declared the scheduled end of a military exercise he ordered in western Russia near Ukraine’s border last week, telling military units that participated to return to their permanent garrisons. There was no indication that Mr. Putin’s move presaged any easing of a crisis that has raised Western fears that the region may be spinning toward a broader conflict. Tension remained high in Crimea where Russian troops are blockading Ukrainian military facilities in what the authorities in Kiev have called a declaration of war. Russia says its action is designed to protect ethnic Russians in Crimea. 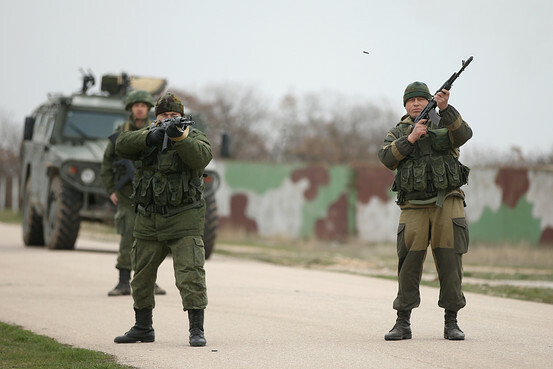 In a graphic illustration of the standoff and its potential hazards, Russian troops on Tuesday fired warning shots in the air as around 200 unarmed Ukrainian soldiers approached Russian positions on the perimeter of the contested Belbek airfield in Crimea to press demands to return to their positions there and conduct joint patrols. Only when the Ukrainians were a matter of feet from Russians firing over their heads did the Ukrainians call a halt and a dozen of them were allowed through the Russian blockade to allow them to take up their former positions. The rest of the Ukrainian force remained outside. In Moscow, the Kremlin responded to American warnings of economic punishment and isolation for its actions in Crimea with a counterthreat that Moscow might abandon the dollar as a reserve currency and refuse to repay loans to American banks, Reuters reported. The warning came from Sergei Glazyev, a Kremlin aide with limited influence over the formulation of a policy but boasting a reputation for staking out hard-line positions, the news agency said. Mr. Kerry was expected to meet with the fledgling Ukrainian leadership that forced President Yanukovych to flee to Russia last month as the crisis deepened. He will be the highest-ranking Western official to meet the administration, signaling the Obama administration’s support for a government that the Kremlin does not recognize. The Russian military exercise coincided with the deployment of Russian special forces troops to Crimea beginning last Friday, though officials maintained it was not directly related to the conflict in Ukraine. 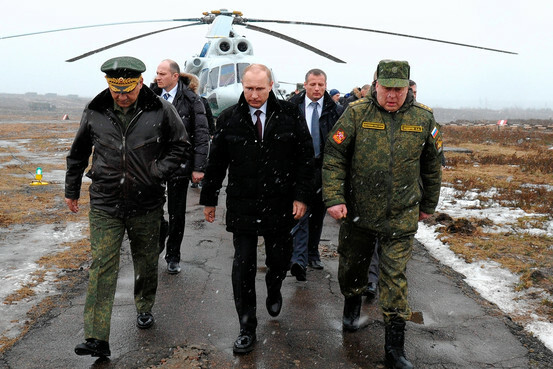 Nothing the Kremlin reported on Tuesday suggested that the Russian operations in Crimea would end. The military exercise involved the mobilization of the entire Western Military District, which stretches from the border of Ukraine to the Arctic, as well as units from the Central Military District, the Baltic Fleet and air defense commands. The troops dispatched to Ukraine are reported to have deployed from ports and airfields in the Southern Military District. Mr. Putin ordered the mobilization only days before Russian forces began spreading through Crimea, and despite officials’ reassurances to the contrary, the timing and scale of the operations had a palpable message. Mr. Putin attended the culmination of the exercises near St. Petersburg on Monday, appearing in state television reports observing live-fire training involving tanks and helicopters. As Ukraine is tugged by the East and the West, many in Crimea welcome Russia’s aggressive stance, hoping Moscow will secure their place in a fractured future. On Monday, the embattled new government of Ukraine accused Russian forces of a major escalation in military pressure over control of the Crimean Peninsula, saying Russia had deployed 16,000 troops in the region over the last week and had demanded that Ukrainian forces there surrender within hours or face armed assault. Russia denied it had issued any ultimatum and no fighting was reported, but Moscow was clearly moving to strengthen its grip on Crimea, brushing aside new admonitions of economic punishment and isolation from President Obama and European leaders. At the United Nations, where the Security Council met for the third time in an emergency session since Friday, the Ukrainian ambassador, Yuriy Sergeyev, distributed a three-page letter asserting that the Russians had sent 16,000 troops into the Crimean Peninsula since Feb. 24. The Interfax-Ukraine news agency quoted an unidentified Ukrainian Defense Ministry official as saying that Russia’s Black Sea Fleet commander had set a deadline of 5 a.m. Tuesday — 10 p.m. Monday, Eastern time — for Ukrainian forces stationed in Crimea to lay down their weapons, and that many Ukrainian soldiers seemed to have taken the threat seriously. Russia’s Interfax news agency said the Black Sea Fleet had no such plans, and the would-be deadline came and went, apparently uneventfully. Still, the conflicting reports only served further to worsen tensions in the Ukrainian crisis, which has grown drastically in the past few weeks to a new confrontation between Russia and the West reminiscent of low points in the Cold War. Russia has denied Western accusations that it flouted international law in asserting military control in Crimea, a historically Russian region that is home to its Black Sea naval base. The Russians have asserted that they moved to protect their legitimate interests there after President Yanukovych fled more than a week ago after protests in Kiev against his shift toward closer relations with Russia. The Kremlin still regards him as Ukraine’s legitimate president. The Security Council meeting in New York was requested by Russia’s ambassador, Vitaly I. Churkin, who told fellow members that Russia had acted to thwart what he called threats by ultranationalists, including anti-Semites, against Russians and Russian speakers inside Ukraine. Mr. Churkin also held up a copy of a letter from Mr. Yanukovych to Russia asking for military help. Although Crimea was relatively calm on Monday, Russian forces tightened their grip on key military bases and other facilities throughout the peninsula, including naval installations and outposts of the border police, and stepped up pressure on Ukrainian officials to declare their loyalty to pro-Russian authorities.